I should have expected this, the kind of sentimental fool that I am. But I never thought I will fall in love with her; at least not during the first few months of our acquaintance. But now that I have decided to leave her for good, perhaps simple nostalgia or sympathy or the habit of cohabitation with her for the last one odd years has changed my feelings for Alleppey from one of intense dislike to mild affection. Alleppey is a town with an inferiority complex. Decades of neglect by the authorities and the townspeople themselves has made the town a shabby, ragged place. As a fellow blogger once recalled his sojourn here for four years as a student decades ago, Alleppey is a dank place, infested with mosquitoes and stagnant canals and decadent, crumbling old buildings. 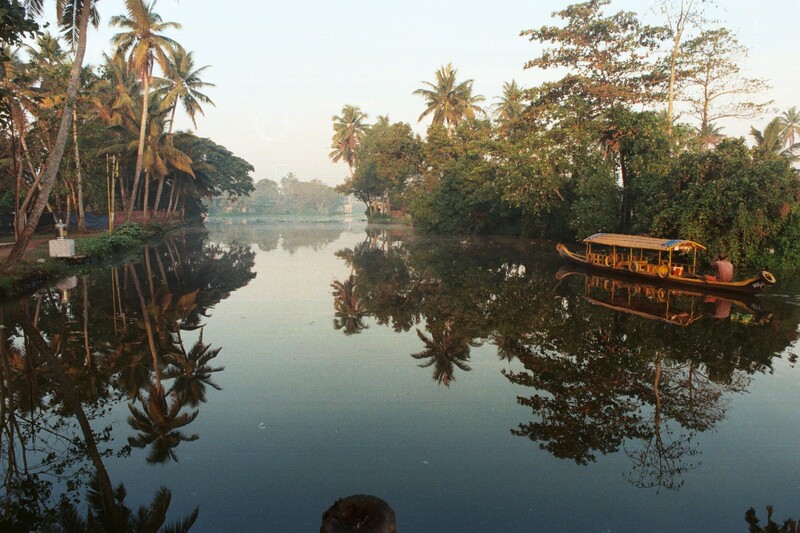 Other than as the gateway to the backwaters, Alleppey has no significance for a visitor. The irony is that Alleppey is comparatively a young town, a planned city. Built by the Dewan of erstwhile kingdom of Travancore, Raja Kesavadas, in order to attract and facilitate trade with foreigners through a harbour, Alleppey now is the ghost of the once beautifully laid out town. f I had it in me, I would have spruced up the town. All it needs are a few implements - a scythe, a broom and a swipe. During my stay here during the last 15 months, I have explored the nooks and corners of Alleppey on my bicycle. Still there remains much more to see, much more to document. The main constraint was that my ramblings on the bicycle is limited to an hour or so, three or four days a week. Having to sit late at work, I have missed the evenings in Alleppey. In the mornings when light breaks in from the east, I could only imagine how the views would be in the light from the opposite, the west. I also could not observe and photograph the people of the town. When I leave Alleppey, I am sure to regret what I have missed, just as I missed a lot at Kottayam. If a year ago you had predicted that I would come to love this town, I'd have called you crazy. In addition to the cityscape, I had disliked the Alleppey accent, its seemingly rough and loutish people. Alleppey is like a mushroom, a fungus. Wherever you may go in Alleppey, your senses would tell you that you are not far away from water - undrinkable, unbathable, that is. It is in Alleppey that I have come to interact with a large number of Muslims in my hitherto life. And they are not terrorists. Many of those simple people are cultured, decent and fiercely honest. Some of their women are just oomph. The farmers of the outlying Kuttanad region may look dark and tough and and shout at the top of their voice, but they are the salt of earth. Farmers and fishermen are closest to mother earth. Their professions are the noblest, feeding the world. Surviving in the harsh environments as they do, it is no wonder that some of them may lack the superfluous gentility of others. What urges me to take VRS and leave Alleppey is the pointless existence, the hours that I spend in the Bank. True, I need a livelihood; I have been at it for 32 years. In another 4 years, I will retire. I could grind my teeth and cling on till then, but as years pass, I am more and more aware of what I am losing because of my profession. I wait, impatiently to tie up the few loose strands and then it will be goodbye to the Bank. But I must say that Alleppey has been kind to me. Unpretentious, the town is indifferent to its shortcomings as well as the epithets thrown at her. She offered whatever she could - and I am thankful for all that - the beach, the old buildings, the dusky skinned women. When I leave Alleppey, all I will take from her is a few photographs. There are no too fond memories; nothing bitter either. I am not going to miss this place, or its people. Perhaps later when I pass through, I might look out for the landmarks that have become so familiar to me, shrug , sigh and turn aside when I realize their erasure. Alleppey has been just a little ripple in my life; and to Alleppey, I am just one among the millions who took shelter under her wings for a while and left. Whether a town or a person, relationships are like that. None are meant for ever. Change, whether in oneself or others has to be accepted calmly. Regret, sure to be, but that will pass, eventually. Alleppey is another chapter about to come to end, so are the relations I had built here. In retrospection, one can say that it had been good while it lasted. Friendship is also like that. Nothing lasts forever. One can always look back and muse on the lessons learnt, for one is always evolving. Just as the town will change, so shall I. Both, I hope, will be for the better. And yes,this moment diminishes too,while I write so. You are a hero on your steel horse, feeling support for a downtrodden princess of a town. I sigh! Years of tough life has taught you to appreciate good and bad things in life. I remember your initial posts on Allepey. In fact you had stopped writing for a while. But see, this is what happens in life - be it with person or place. But it will wither away; all that will remain are memories. And you call it mild affection! A beautiful post Balan Sir! You have reminded me of all those places I have left behind - always for a better opportunity! Wishing you too the best as you head home to P! Her smile (from what I have seen from the pictures you have shared) melts me. Keep it going! @melange: There is life even in inanimate things; it is the observer that breathes life into it. I have been reading Stephen Alter's book on his boyhood in Mussorie - I wish I could write at least one sentence the way he has! @Kavita: :-) You know the extent of my passion when I talk about Himalayas! @Elizabeth: Excited,sure, but have to admit to some apprehension about the unknown! And what really perplexes me about Alleppey is that it is so easy to transform her to a great beauty! Look at the way people throw their trash on the public places! When I was a little girl, I came home from school one day, begging my parents to allow me to go see the 'Ell-O-pee" races with my friend who was going to go there with her family. Much back and forth later, my dad found out that it was the Alleppey boat races that were in question, and yes, I was allowed to go and watch them. It was the highlight of my sixth year of existence! I still remember the boats striving to pull ahead of their competitors, the roar of the crowd as they neared the finish line. @Sujatha: LOL! For a minute I got stuck with 'Ell-o-pee'!Which year was that? The Boat races are pretty much the same, except for the fact that commercialization rules! Since the races fall on a working day, I could not attend the last couple of times. And the crowd is too much. Thoroughly enjoyed reading this post. Such fondness in your post, such warmth. Leaving anything behind is never easy. I hope you can photograph more, especially its people before you take the transport out for good. And yes, a broom and a swipe can do wonders. My Uncle used to be a banker and I envied him his postings because they'd be these back-towns with so much character, different from cities. I thought Banking must be interesting not so much for the hard hours but for the fact that one got transferred to places that are, well, different. While I understand it must be interesting for a quick visit, it may not be so for another having to live and work there, still it must be interesting. Always wondered about Allepy, its name sounds so intriguing. Never been there yet. All the best with your next phase. @anilP: 'Alleppey' is the English corruption of 'Ala-puzha', which mean Land of River. Yes, like any place (other than the hometown), Alleppey is OK to visit for a day or two. As towns go, it is very small; it could be the smallest district capital in the state. Like I wrote, my office timings restrict my photographic forays. But I hope I will be able to shoot a little more before I leave. Banking, like any other profession is fine - for those who like the profession! Glad you liked the post, Anil - thanks!